When you purchase a new version of this casebook from the LIFT Program, you receive 1-year FREE digital access to the corresponding Examples & Explanations in your course area. Now available in an interactive study center, Examples & Explanations offer hypothetical questions complemented by detailed explanations that allow you to test your knowledge of the topics covered in class. Starting July 1, 2017, if your new casebook purchase does not come with an access code on the inside cover of the book, please contact Wolters Kluwer customer service. The email address and phone number for customer service are on the copyright page, found within the first few pages, of your casebook. 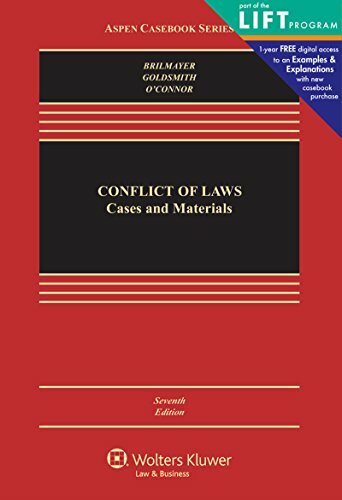 Chapter on Conflict of Laws in the Federal System, which was deleted in the 6th edition, is added back at the request of adopters; the chapter does not attempt a comprehensive coverage of issues that are typically addressed in a civil procedure or federal jurisdiction course but instead focuses on the federalism questions that are relevant to conflict of laws. Continued coverage of the First Restatement rules that continue to be important, with less emphasis on First Restatement rules of less relevance today.